Shirdi Sai Baba Stories,Leelas and Teachings. 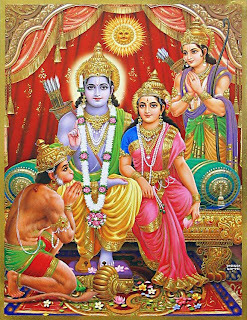 : Ram Vijaya-Chapter 41. Here is chapter-41 from the book Ram Vijaya. Readers who have missed out any chapter can read them by clicking on the link provided below this chapter . Jai Sai Ram. 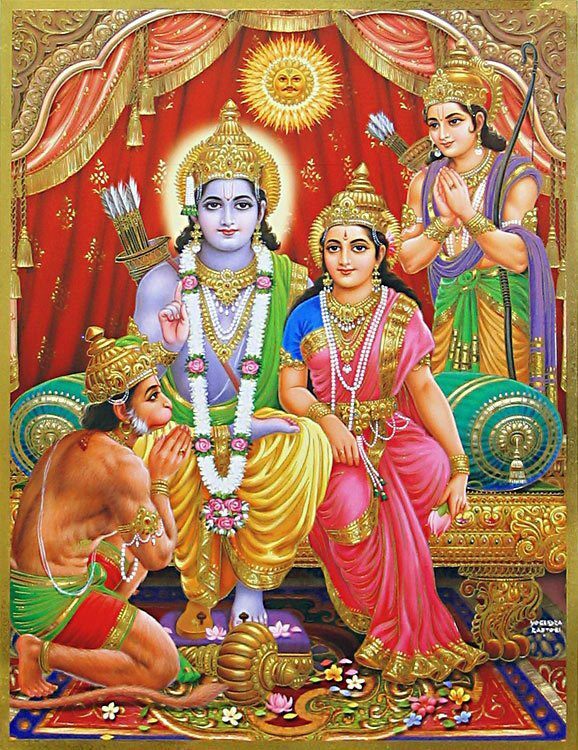 At this time Indrajit created by his mantras a woman exactly like Sita and, having seated her in his chariot, came to the field and loudly said in the hearing of all the monkeys, " You see, on account of this wretched woman my father has suffered much. If her head is cut off, every thing will end in peace, and there will be no war-" So saying he cut off the head of the woman. And immediately he went to his county, Nikumbala, to perform a penance with a view to get from the deity of fire a divyaratha*[ A beautiful, fine and charming chariot,] with horses and weapons. He entered a solitary place and, posting deions to watch it, began to perform the penance. Indrajit killed for the purpose many Brahmanas and cows and, polishing his body with their blood, seated himself upon corpses and carcasses, made a liavan^[Oblation by fire to a deity.] and offered the deity of fire the heads of Brahmans and cows. The deity having been pleased with him, half of the divyaratha came out of the havan. Maruti believed that the woman, whose head had been cut off, was Sita and communicated the sad news to Rama and Lakshuman, which disheartened and disappointed all. In the meantime, Vibhishan came and informed Rama and the monkeys that Sita was safe in the Asoka forest and that the Sita, whose head was cut off by Indrajit, was created by him with his mantras. Listening to what Vibhishan had said Rama made a sign to Lakshuman, who had observed fast for 14 years, and bade him go with Maruti, Sugriva, and the other monkeys to Nikumbala to Jostroy the havan and kill Indrajit. Lakshuman accordingly went with them to Nikumbala and destroyed the chariot and havan. The noise of the monkeys aroused Indrajit who was in deep meditation ; and finding that the ha van was destroyed, he was so furious that Ije let off at them a tain-weapon, which produced the rain and flodded the army of Lakshuman. The prince discharged a wind-weapon, which produced the wind and dispersed, the rain. Indrajit stopped the wind by a mountain-weapon, which produced innumerable mountains, when Lakshuman let off a diamond-weapon, which produced diamonds, and broke the mountains. Indrajit lastly let off five arrows and struck Lakshuman with thorn, when Vibhishan threw his gada* at the demon-prince, who cut it off and struck his uncle with five arrows. At last Lakshuman let off a deadly arrow and broke his head with it, and his chariot was broken and horses killed by Jambuvant. Indrajit however fought alone on the ground, when all the monkeys threw at him innumerable mountains, rocks, and trees at one and the same time, but he broke them with his arrows in no time. He then jumped into the sky and, hiding himself in the clouds, let off arrows at Lakshuman. Then, Maruti placed the latter on the palm of his hand and lifted him up in the sky where he fought with Indrajit, Whereupon the demon-prince came down, when Maruti brought Lakshuman on the ground. They fought for some time on the ground. But at last Lakshuman cut off with his arrows the thighs, arms and the head of his enemy.